HOUSTON, Texas, April 13 (SEND2PRESS NEWSWIRE) — In an online promotion running from April 15th through July 15th, 2011, Whiteflash is asking their avid followers and loyal customers to become friends and win BIG glittery prizes by “friending” them through the brand’s popular Facebook page. Creating the best recognition for friends, family and colleagues, Whiteflash will make having lots and lots of friends wonderful in every way. Taking a page out of the playbook of many social media enthusiasts, the brand launched an initiative to beef up their Facebook fan following and extend their reach even further into cyberspace. Already the go-to one-stop-shopping diamond marketplace on the web for superior quality diamonds, Whiteflash offers an unprecedented selection of meticulously selected and ideal cut diamonds and jewelry to match every budget and every occasion. 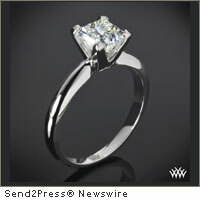 * July’s Grand PRIZE: A CUT ABOVE® Princess diamond ring in a tiffany style solitaire setting ($1,800 value). The steps are simple and no doubt will fit in easily with your daily Facebook use. 4. As a bonus, if you answer the weekly Whiteflash.com pop quiz correctly you get 5 bonus entries into the final random drawing. Not forgetting their loyal clients, Whiteflash is offering them an additional extra. For previous Whiteflash customers who refer their friends or colleagues, Whiteflash will send them a super sized check for $200 (**See notes) as a thank you-now that’s paying it forward. So let’s get friendly…On your mark; get set; FRIEND! Whiteflash is the first company in the U.S. to offer an exclusive brand of Hearts & Arrows diamond and bring the sheer beauty of “super ideal cut” to the Internet. Debi Wexler, a computer entrepreneur, founded Whiteflash in 2000 bringing an expansive selection of loose diamonds to the Internet, including an exclusive brand of Hearts & Arrows diamonds. Whiteflash A Cut Above® is unmatched in its brilliance, fire and sparkle and remains the only Hearts & Arrows diamond sold online with advertised standards and a “true patterning” guarantee. Whiteflash also offers original, handcrafted platinum and gold settings, diamond engagement rings and wedding bands, custom designs and specialty jewelry. For more information, log on to www.whiteflash.com or call 877.612.6770. *This promotion is in no way sponsored, endorsed or administered by, or associated with, Facebook. Winners will be chosen in a random drawing on July 18, 2011. Minimum purchase for $200 check reward is $3,000. Full contest rules are available on April 15th. **Visit www.whiteflash.com to see specific details and rules for claiming your $200 referral award check. – RSS news feed for Whiteflash Inc.: https://send2pressnewswire.com/author/whiteflash-com/feed .